Last summer, there was an exhibition in an art museum on Rembrandt’s works. I did want to go see the exhibition, but failed to do so. I wish I could’ve seen the drawings of Rembrandt, so I looked up for the books about his drawings. I found several books of Rembrandt, but one of the books was containing interesting topic. The author focuses on the noses in the portraits of Rembrandt. He feels that the noses possess a will of their own. They have their own inclinations and seem to obey their own promptings rather that the laws of objective resemblance. They are long and slender, flat and squat, smooth or wrinkled, bony of fleshy, dainty or gross, pitted, scarred, inflamed, unblemished. According to the book, Rembrandt indicates a nose with a vertical tick or a pair of dots for the nostrils. He lavished as much care on layering pigment to build up a nose as on capturing the play of reflections and shadows in an eye. He rendered the complexion of a nose with the same fastidiousness he brought to paraphrasing the sheen of velvet or fur. In his portraits and self-portraits, he angles the sitter’s face in such as way that the ridge of the nose nearly always forms the line of demarcation between brightly illuminated and shadowy areas. A Rembrandt face is a fact partially eclipsed; and the nose, bright and obvious, thrusting into the riddle of halftones, serves to focus the viewer’s attention upon, and to dramatize, the division between a flood of light – an overwhelmingly clarity- and a brooding duskiness. If the sitter is the lead actor of a performance, then the nose is his understudy on the stage of the face. The nose stands in the center, the focal of our gaze, if not the exact center, and demands that we notice it. It’s a peacockish actor: too obvious, too egotistical, too histrionic. It upstages the rest of the face and would make us forget that its posturing is mere vanity and vacuity compared to the eloquence of the eyes and lips. Rembrandt tried on faces-and noses-like a child making grimaces in a mirror. Of the eighty-odd self-portraits now accepted by Rembrandt scholars, no two are alike. While all are recognizable as portrayals of the same man at different stages of his life and in different roles, circumstances, and moods, they display such an extraordinary variety of expressions, and the features are molded in such a diversity of shapes, that looking at them as a body is like leafing thought the scrapbook of an actor blessed with a particularly rubbery face. Here is the artist as a soldier; here he’s a gay blade, a beggar, a burgher, St.Paul, Democritus; here he is laughing or putting on a frown; here he looks terrified; here, inexpressibly sad. 1. Self-portrait in a Gorget, c.1629. Oil on Wood, 15 x 12⅛inches. In this picture, the center of gravity, the weight of the face, is upward to the nose, which juts almost architecturally against the shadowy dark quarter of the moonlike visage. It is only after one’s gaze takes it in, with its tip mere millimeters below the picture plane and the soft highlights on the ridge trailing upward into the slight depression between the eyebrows where a thoughtful frown is gathering- only then does one begin notice the other details of this stunning painting: the reflective eyes, the wisps of hair against temple and forehead, and humid lips, the 5’o clock shadow on the well-propositioned chin, the bright tones on the scarf and gleaming gorget. This is one of the Rembrandt’s least theatrical, most intimate self-portrayals; it’s as much a depiction of the state of being absorbed in though as it is a straightforward description of flesh. The eyes concentrate the sitter’s reflective mood; the nose proclaims his physical reality. 2. Self-Portrait, 1629. Oil on Wood. 6⅛x5 inches. Munich, Alte Pinakothek. In the above self-portrait, the uncertain gleam of pale light on his cheek, the edge of lips, and the orb of his rounded nose – a pale moon suspended before the stormy moon of his face – appears to be cast by an unsteady lantern, and it reveals a darkness more unfathomable than the murk it lights up. The eyes, nostrils, and parted lips- those gateways to the obscurity within the artist’s soul- are caught, in that flickering instant, in a welter of hatched, dabbed, slashed, scraped, and scratched brushstrokes which anticipate the tempestuous surfaces of Rembrandt’s final years. He’s painted a storm here, in more senses than one. 3. Self-portrait in a Cap, Open-mouthed, 1630. 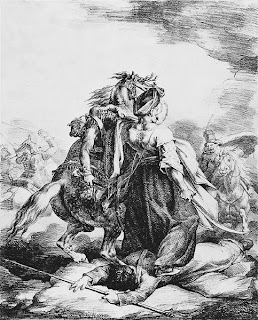 Etching (B.320). Amsterdam, Rijksmuseum. Rembrandt depicts himself struggling to shape his lips around a whistle or, in this case, soundless whisper. This time the light rakes his face, as the knowledge of what makes him flinch and grimace harrows his mind, shedding its glare on the tapering, elongated pyramid of a nose jutting out with an architectural indifference to the storm sweeping the rest of his features. And the nostrils are exposed, as if to indicate, like the open mouth and shocked eyes, that the artist is defenseless. He has not donned his armor here, is garbed in no finery or protective camouflage, and has no weapon other than the useless parody of a tusk formed by the shadow cast by his all too vulnerable nose. Michael, Taylor. Rembrandt’s Nose: Of Flesh& Spirit in the Master’s Portraits. Distributed Art Publishers, Inc. New York, 2007. Théodore Gericault, one of the pioneers for the Romantic Movement was born in Rouen, France September 26, 1791, where he was educated in the tradition of English sporting art by Carlet Vernet and classical figure composition by Pierre-Narcisse Guerin. Gericault left Rouen to study at the Louve where he copied paintings and drawings from various artists including Rembrandt. He is known for his styles of Neo-classicism as well as romanticism and is most famously known for his painting, "The Raft of Medusa." This famous French painter and lithographer lived a short life dieing at the age of 32 in Paris January 26, 1824. Gericault was known for his paintings involving sports, animals or war. The sporting events he usually depicted were English sporting events that he watched while traveling to London in the early 19th century. 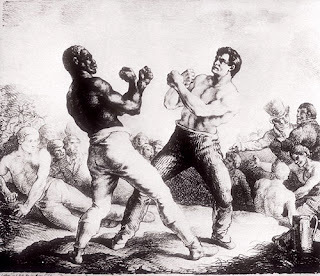 Figure 3 is a drawing of a boxing match done in ink on top of pencil with chalk. I just felt he did a great job depicting this match using the darkness of pen mixed in with the pencil. This is a technique that he used in a number of his drawings and one that can also be seen in Figure 1. Gericault has a love for animals pariculary horses and this man hugging the horse in the water shows a lot of compassion in his drawing. There is not much else going on in this composition but the man and horse are both outlined in ink while the rest of the image is in pencil. 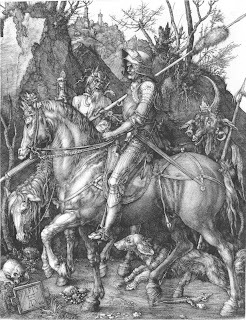 Figure 2 is one of his famous war depictions done in completely pencil. I thought it was interestig in how he depicted a valiant horse with men all over the ground again showing his compassion for animals. I was hoping to be able to scan a few more pictures from his masterworks but the scanner in Lilly was not working but i hope everyone enjoyed this pictures. Grunchec, Philippe. Master drawings by Géricault / Philippe Grunchec. Washington, D.C. : International Exhibitions Foundation, c1985. In some circles, the German Renaissance is called the “Age of Dürer”, after the renowned engraver, painter and graphic artist born in Nuremberg on May 21st, 1471. Albrecht Dürer, named after his father, a goldsmith craftsman, preferred the expressiveness and representational possibilities that painting offered, as opposed to his father’s trade. He switched his apprenticeship to the former discipline by the end of 1486. Dürer's time was one of upheaval and plague, since while Europe was shaking off its Middle Age cobwebs to embrace the new ideas and paradigms that the Italian Renaissance hinted at, it still had to cope with the occasional siege that malaria or some other virulent strain could inflict on a city. Two plagues that ravished Nuremberg in 1494 and 1505 presented Dürer with the opportunity to visit and learn from Italy, the most significant artistic center in Europe at that time. 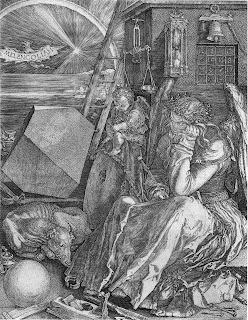 While Dürer’s most prolific period began in 1495 and extended to about 1510, the three works I wish to highlight were engraved in 1513-1514, when Dürer’s mastery of copper engraving had reached maturity, and constitute an allegorical trilogy concerning the different spheres of human action and knowledge. Dürer fell ill and died extremely suddenly in 1528, at the age of 57. By then, he was already one of the most renowned artists in Europe. Personally, I've come to really appreciate the visual effects possible with engraving and Dürer's pieces, together with Gustave Doré's, are some of my favorite in this medium. 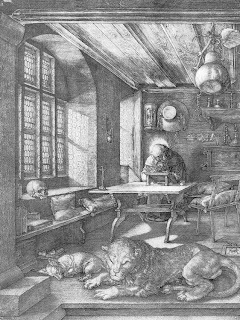 Following the via activa, Dürer highlighted the via contemplativa, in St Jerome in his Study (1514). What I find most striking in this work is how Dürer manages to masterfully convey light and its effects on different types of surfaces, such as the stone columns, and wooden table, with what is fundamentally a binary value. Unlike pencil, with a broader range of available grays, Dürer’s copper engraving use a much more uniform ink and it is basically the differences in ink concentration that denote darker or lighter areas. As Erasmus of Rotterdam pointed out in 1528 about Dürer’s engravings, “these things are placed before our eyes with the most felicitous lines, and black ones at that, in such a matter that, were you to add colour, you would not do justice to the work” (Moser, 2005). I also find the juxtaposition of the tidy home with the resting lion inside it, although a symbol traditionally connected to St. Jerome, to also highlight the dormant inner turmoil that is housed in the external trappings of order and social restraint. Also like the previous engraving, this one prominently features a skull on the left-hand side, perhaps as a further reminder of the omni-present reality of physical extinction. We end with my favorite Dürer work, Melancholia (1514), which in a sense complements the arenas of human inquiry and action that were explored in the previous two works. Although the previous two engravings made some use of hyper-realistic elements, such as the Devil and St. Jerome’s halo, these elements take center stage in this work, which can be viewed as a collection of symbolic entities. There is no single, fully accepted interpretation for the overall significance of each of the components of this engraving, although the overarching themes seem to be imagination and reason. References to mathematics (such as the polyhedron, the sphere and the magic square), architecture (tools), and the otherworldly (angels) highlight the different intellectual realms. The magic square reference is the first in European art and, at the time, was heavily linked to astrology. True to its title, there is also an underlying despondency in the work, with both angels and the lamb displaying rather somber expressions. Finally, beyond the different single and compound symbolisms, one can appreciate the wonderful line work used to produce different values and textures. For instance, the polyhedron features a dotted texture, while the water behind it consists of a series of horizontal lines of varying intensity. Also, the way the larger angel's dress folds and flows beautifully contrasts with the regular, geometric lines of the polyhedron and the sphere, in a way emphasizing the intellectual difference between them as well. Moser, Peter. Albrecht Dürer: His Life, his World and his Art. Babenberg Verlag, Bamberg, Germany, 2005. Eichberger, Dagmar and Charles Zika (Eds.). Dürer and his culture. Cambridge University Press, Cambridge, UK, 1998. Over the summer, I had the pleasure of getting a special tour of the Corcoran Gallery of Art. Walking around the exhibits, I was thoroughly enjoying myself when I all at once came to a room sectioned off from the rest. Within this room was Frederic Edwin Church's depiction of Niagara Falls from 1857. I was in awe. I sat down in the room for quite some time looking at the painting. For this reason, I was quite interested in learning a bit more about Church and his other paintings. Frederic Edwin Church was born on May 4, 1826 in Hartford, Connecticut. He was considered part of the "Hudson River School" of American Landscape Painters. The Hudson River School was a group of painters influenced by Romanticism, and members of the school painted images of the Hudson River Valley and surrounding areas. Church grew up in a wealthy family, enabling him to pursue his painting aspirations. He made his livelihood by traveling throughout the summers sketching, and then returning to New York in the winter to paint, teach, and sell his works. One of his most famous work is "The Heart of the Andes" which he painted in 1859 after a trip to South America. The painting is more than five feet high and ten feet long, and it is currently hanging in the Metropolitan Museum of Art. In revealing the work, Church made the event into an elaborate show, charging the audience admission and hiding the painting behind a curtain until the reveal. It was sold for $10,000, the highest price ever for a living American artist at the time. Church had a huge influence on the building of his home in Hudson, NY. The home was a Persian-Inspired mansion now known as Olana. Church even made several architectural sketches for the design, including ideas he got from his travels around Europe with his family. This information made me even more interested in Church as I have an interest in architecture and architects. Church, Frederic Edwin. Treasures from Olana: Landscapes by Frederick Edwin Church. Hudson, NY: Olana Partnership, 2005. Davis, John. Archives of American Art Journal, Vol 34, No. 2 (1994), pp. 21-28. Smithsonian Institution. Retrieved from www.jstor.org. Smithsonian publication 4657. Frederic Edwin Church. Smithsonian Institution, Washington, DC, 1966. Georges Seurat was born in Paris, France on 2 December 1859. He first studied under the sculptor Justin Lequiene and then attended the Ècole des Beaux-Arts in 1878 and 1879. He greatly influenced the direction of modern art by initiating Neo-impressionism with works like his most famous piece, Sunday Afternoon on the Island of La Grande Jatte. Seurat is most famous for his painting using the pointillist painting technique, while his drawing often remain overlooked. Before he began his major paintings though, Seurat was all about drawing. The majority of the existing drawings from Seurat are from this period before his paintings and they seem to have their own unique quality to them, not directly relating to any of his later major works. There are some drawings that do have a slight correlation, perhaps beings studies for his paintings, but even in these, the distinct visual representation used in his earlier drawings exists. Seurat’s drawings greatly influenced the development of modern drawing. 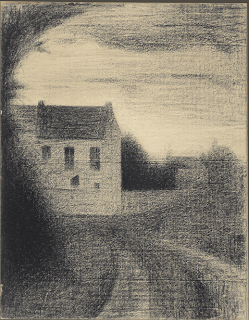 Seurat’s drawings often present a paradox. His technique incorporates very clear figures, while adding an element that creates a sense of ambiguity. A common characteristic attributed to Seurat is the liberation of the Line. Rather than using this element as the rigorous structure that it most often is, he used an abundance of lines, which seemed to swallow up the idea of line. Seurat believed that art was the only place that two mutually exclusive realities could be synthesized and developed into a harmony of opposites. 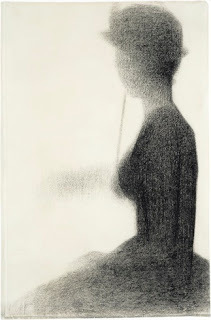 When studying Seurat’s drawing one might find that his work is hard to describe. The subjects seem to be fleeting and the meaning of his work is often rooted in our own perception of the subjects as existing in the drawing. The drawings are mostly done on a type of paper called Michallet. This is a French handmade laid paper made using a paper mould. This mould uses metal rods across a frame on which wet pulp is laid. The rods cause the paper to form laid lines, which are parallel lines of alternating thick and thin pulp. There are also chains used to hold the rods in place that form chain lines. A key element of Seurat’s drawings comes from incorporation of these lines into his work. Seurat’s choice drawing tool was the Conté crayon. In order to manipulate the crayon, he used stumping, erasing, and at times a scraper (sort of subtractive techniques like we have used in class). This past summer in New York, I was able to see a performance of the musical Sunday in the Park with George. This musical, written by Stephen Sondheim, is based on the life of Georges Seurat and his creation of Sunday Afternoon on the Island of La Grande Jatte. I loved the musical. I was browsing the books in Lilly and found his drawings. I was immediately drawn to his way of representing the world. I find his drawings to be very engaging, really attracting a viewer to the image and its paradoxes. Square House. c. 1882-84. Conté crayon on paper. 12 1/16 x 9 3/8"
http://z.about.com/d/arthistory/1/0/9/a/sd_06_housesq.jpg (link for a larger image). This drawing is an example of Seurat's use of the laid lines and chain lines created during the formation of his paper. The lines become an element of the picture itself, being incorporated into the overall structure and adding to the ambiguous feeling that often accompanies Seurat's drawings. At the Concert European. 1886-88. Conté crayon on paper. 12 3/4 x 9 3/8"
This image is not only a wonderful example of the style and idea of Seurat's work, but it also shows one of his favorite types of subject, Amusements of the people. Seated Woman with a Parasol. 1884-85. Conté crayon on paper. 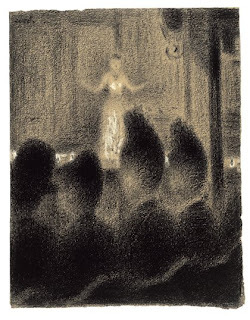 This drawing shows an occasion on which Seurat did drawings as studies for his later paintings. This particular one is for Sunday Afternoon on the Island of La Grande Jatte. Franz, Erich and Bernd Growe. Georges Seurat: Drawings. Little, Brown and Compay, Boston. 1984. Hauptman, Jodi. Georges Seurat: The Drawings. The Museum of Modern Art, New York. 20007. Born on July 15th, 1606 in Leiden, the Netherlands, Rembrandt was a Dutch painter and etcher. Hi is considered one of the old masters of painting and printmaking. As a child, he attended Latin school and enrolled in university, but he had a fondness for painting. Thus, he was apprenticed to a Leiden history painter, Jacob van Swanenburgh. After an apprenticeship with famous painter Pieter Lastman in Amsterdam, Rembrandt opened his own studio and accepted students. Rembrandt was discovered by Constantijn Huygens, who procured his commissions from the court of The Hague. In 1631, Rembrandt moved to Amsterdam and began as a professional portraitist. In a couple of years, Rembrandt moved to a fancy house in Jodenbreestraat, where he frequently sought his Jewish neighbors to model for his Old Testament works. Before his death in 1669, he was still procuring major commissions for portraits and other works. In a letter to his discoverer, Rembrandt said he sought to achieve "the greatest and most natural movement" in his art. His etchings and drawings are of the most interest to us. His works display much freedom and breadth. Some drawings have large areas of white space for space; some have complex lines and dark tones. Some of his main subjects seemed to have been Biblical scenes, landscapes, and portraits during different periods of his work. Modern estimates credit him with around 300 paintings, 300 etchings, and 2000 drawings. I like his style due to his major use of varying thin and thick lines to produce most of the information in his drawings. They have almost no shading, and the light and dark areas are mostly conveyed with thin and thick lines. The style is very expressive, somewhat unlike my own, so it's a nice contrast. Many times his drawings seem very messy, but they produce very deep sense of emotion and presence. This piece shows a view of London with Old St. Paul's from the north. Again, you can see the varying thickness of the lines, the squiggles and expressive nature of the work. Many random lines make up a coherent piece of information, along with large swaths of white space, giving a sense of openness. This piece shows Cottages Amongst High Trees using pen and brush in bistre. Such a simple drawing using squiggles and lines, yet it shows all that it needs to show. The lines seem to flow without stiffness and exact purpose, but nevertheless come together to form the image nicely. Slive, Seymour. Drawings of Rembrandt: Volume I. Toronto: Dover Publications Inc., 1965. Slive, Seymour. Drawings of Rembrandt: Volume II. Toronto: Dover Publications Inc., 1965. Many artists live long lives filled with distinct artistic change as they age and grow wizened. Taddeo Zuccaro was not one of these, but due only to circumstances beyond his control. Zuccaro died, like Raphael, at the too-young age of 37, giving him a working life of just under 20 years. He was born on September 1st in 1529 in a small northeastern Italian town called Vado. Zuccaro moved to Rome at the age of 14. At the age of 18, he painted the decoration of the facade of the Palazzo Mattei. This was Zuccaro's "big break"; it was praised all over Rome, and it cemented his reputation as an artist and brought him a steady stream of commissions. Zuccaro began a career primarily as a fresco painter, in general tending towards large, expressive frescos during his life. His brother was an artist, as well as his father. He was buried in the pantheon, near Raphael. Zuccaro is notable both for his talent and his prolific output; he often worked under pseudonyms, and as thus, putting together a complete record of his artwork is an extremely difficult and perhaps impossible task. He drew in a very quick, expressive style. His linework is extremely detailed but also very rough, suggesting active motion and a quick hand. His drawings that remain tend to be small, but a vast majority of his work was done large-scale, as frescos. For obvious reasons, many of his most important frescos no longer exist; the realities of pollution and degradation can destroy even the best preserved frescos. As such, his drawings become even more important; they offer us a window into his extraordinary frescos and his thought process as he drew. Zuccaro's work drew me in with his strong, bold lines and the sense one gets when looking through his sketches that he was a very quick artist. Sources indicate that one of his greatest talents as an artist was a sort of inhuman speed in which he would draw; his sketches and drawings seem to support this, built of loose and strong strokes. Zuccaro clearly drew confidently, and his work (while very realistic) has a sort of almost cartoonish spontaneity and spirit to it that I personally find rather inspiring. This drawing was done in pen and brown wash, and measures 170x247 mm. I find it an interesting sketch, expressing both Taddeo's skill at creating realistic images with quick, scattered lines and his control over line weight and scarcity to create active dimension and shape. The picture captures movement extremely well, and the tree is a brilliant use of linework to create shapes that seem almost whimsical. The drawing seems (to me) almost modern, and brings to mind drawings from the early 1900s and cartoons. Fascinating linework in this one. The horses are very well drawn, again using scarce few lines. There is a certain sense of movement in this picture as well, with the lines drawn quickly and with a definite sense of motion to the one reining in the horse. The soldier on the left, however, is a perfect portrait of a casual stand; the soldier is a model of sedentary observation. Zuccaro's linework and composition all works to strengthen that impression the image leaves on the viewer. I thought this one was really cool. Zuccaro uses negative space effectively with St. John's right arm, making it seem as though it is almost an ethereal extension of his body. This one was done in brush and red wash. It's 242x135mm, though with the depth that Zuccaro expressed with his wash, it seems quite a bit larger (at least to me). 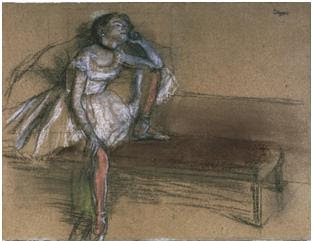 Edgar Degas was born in Paris on July 19, 1834. He began painting early in life, but his father expected him to go to law school. Because of his father's wishes, he enrolled at the University of Paris to study law. A few years later he met Jean Auguste Dominique Ingres, whom he admired for his work. Soon after, Degas went to the Ecole des Beaux-Arts and followed Ingres's style. Degas spent much of his life learning to draw and paint by copying in the Louvre and looking at other famous artists' works. He is mainly known as an Impressionist artist, but he never wanted to be called that, nor did he think it was accurate. I chose to do Edgar Degas because I love his paintings of dancers. As I started to research him more, I realized that he is also very well known for his drawings and studies that he conducted in preparation for paintings and other mediums. The pictures I chose to include offered a variety of styles and mediums. For example, "La Korrigane, Act I" is very detailed and precise, whereas "Melinda Darde" is very loose and free. Also, "Portrait of Manet: studies" is done with crayon and ink wash, versus "Dancer Resting," which is done with black and white charcoal. In "La Korrigane, Act I" Degas used horizontal lines to shade the sky and ground. 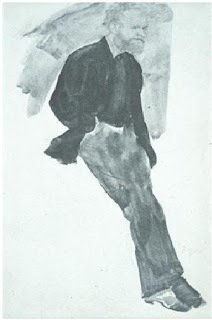 For "Portrait of Manet: studies" he used an ink wash, which makes the shading very abstract and fluid. Even though many people only think of his dancer paintings, he was very talented in many different styles and mediums. For the drawing "La Korrigane," I'm really sorry but I could not get the scanners to work. 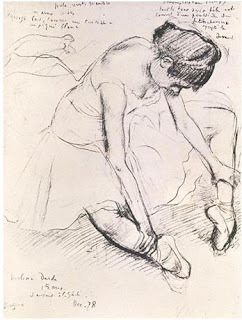 The drawing was in the book Degas and the Dance in Lilly. I also could not find a copy of the picture online that I could put in the post. Boggs, Jean Sutherland. Galeries Nationales du GrandPalais (France). National Gallery of Canada. Metropolitan Museum of Art (New York, N.Y.). The French painter Paul Cezanne has been called the father of modern painting. Though his paintings were ridiculed by critics through most of his lifetime (they were described as "dirty" by Manet), his art influenced the development of many 20th century art movements, such as Cubism. Described by George Moore as "the anarchy of painting, the art of delirium," Cezanne's paintings were an outgrowth of Impressionism. The development of his style and the subject of many of his paintings was the provincial landscape, which is fitting as he was born in the idyllic Aix-en-Provence on January 19, 1839. With his father comfortably established at the head of a bank, the young Cezanne enjoyed a comfortable childhood. In 1852, he attended College Bourbon, discovering his love for art. Afterwards, Cezanne decided to pursue a career in the subject in spite of his father’s insistence that he study law. The next few years were difficult for the artist as he attempted to define his style amidst the criticism his works received. Eventually, he met Camille Pissaro who served as a mentor and friend, teaching Cezanne to use primary colors to lighten the palette and short brushstrokes of color to establish an “impression” of the panorama. Towards the end of his life, Cezanne watched his works gain increasing renown, but he remained faithful in his pursuit of understanding color and art until his death in 1906. I decided to write about Paul Cezanne because I have always enjoyed looking at impressionist art with its exploration of color and light. Cezanne’s paintings not only adopt these principles but also, in his words, reveal that color “is biological…is living, it alone gives life to things.” I liked his loose, yet accurate portrayal of landscapes and especially his use of color to convey perspective. In his time, this was a very radical method of painting, and I liked that he pursued his study of art despite the criticism surrounding his work. 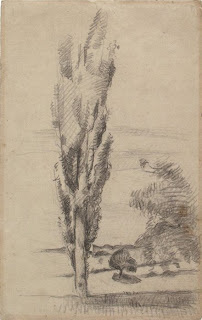 The following work, titled The Poplar, was created using graphite around 1879-1882. The loose style and lack of straight lines and defined structures is characteristic of Cezanne’s portrayal of nature. It is very fluid and one gets the sense that the leaves are blowing in the wind. There is some use of perspective, as the tree in the background is smaller than the tree in the foreground and the use of shading was probably intended to be used as a study in the way light was captured by the landscape. This painting, titled Chestnut Trees and Farm at Jas de Bouffan was painted in 1886. 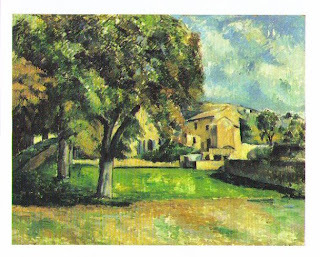 The subject of this work is Cezanne’s home in Provence, which is in the south of France. Characteristic of this area, the lighting allowed for Cezanne to use color to create perspective. Generally, Cezanne used darker colors to represent objects that are farther away. This shows the importance that color played in Cezanne’s work. In fact, Claude Monet who witnessed Cezanne in action noted that Cezanne used a black hat and a white handkerchief to establish the poles for color before he began painting. In this work, Cezanne demonstrates masterful use of color to represent light in the rendering of the sky—spots of white with specks of gold—and the field, especially the shaded areas beneath the trees. Again, his style is characterized by loose lines when it involves natural objects and geometric straight lines in his depiction of the house, and experimentation between color and light. Titled The Bridge at Maincy, this painting was created by Cezanne in 1879-1880. The dominant element of this piece is the lush green of the trees and surrounding vegetation. 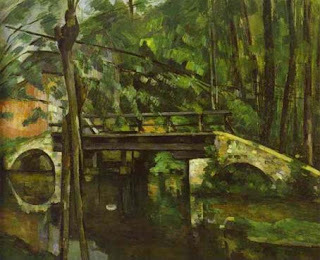 In this experimentation with light, Cezanne paints the reflection of the bridge and trees on the water. The bridge however, is strictly defined by geometric shapes. The capturing of light and his strong use of color illustrate the beautiful landscape of the area. Just for fun…I found a (rather low quality) image of the modern-day Bridge at Maincy, the subject of the above painting. See the similarity? Romano, Eileen. Cezanne. Art Classics. New York, NY: Rizzoli International Publications, 2005. Impressionist Art Gallery. 26 Feb. 2009. Dunlop, Ian. Orienti, Sandra. The Complete Paintings of Cezanne. Wallop, Hampshire, 1970. Washington Allston was born in South Carolina on November 5, 1779. He is the first generation of American artists who grew up after the American Revolution. Allston entered Harvard College in 1795. After his graduation, he sold his inherited land and used the money to study painting in Europe. Although Allston had been drawing since he was a child, he did not receive his first serious training in paiting until he went to London. It was in London that he developed a sound and coloristic technique. He later spent a year studying Napoleon's Louvre, the first modern museum of painting, and another 4 years in Italy. During this period, he was greatly influenced by the coloristic style of the Venetian and Roman painters of the sixteenth and seventeenth centuries. He formed a love for mystery and fantasy, which later transformed his painting into moods of romantic imagination. He is considered one of the first true romantic artists. Allston did not depend on portrait painting for a living. He only painted people who were important to him. His self-portrait (Figure 1) showed his influence by the mood of Titian's portrait, of which he studied in Louvre. His manipulation with colors and lighting revealed a grave and brooding tone in his portraits. Allston often uses one of the primary hues - red, white, yellow, and blue, to create a tone for the the entire painting. His landscape painting (Figure 3) and myth figure painting (Figure 2) illustrate his use of glaze to induce an atmosphere of mystery and dream, a predominant characteristics in his work. Allston is also a published writer. In his early years, he wrote humorous staire and did a few humorous drawings. However, it was not his true passion and he later switched to poetry and essays on the theory of art. His painting and writings inspired a generation of artists and writers, including Samuel Taylor Coleridge, and Ralph Waldo Emerson. Bjelajac, David. Washington Allston, secret societies, and the alchemy of Anglo-American painting. Cambridge: Cambridge UP, 1997. Francis Barlow was an English illustrator, painter and etcher (1626-1704). He is considered to be one of the first masters of English illustration. His fire famous piece of work was for Edward Benlowe's Theophila, a 268 page religious poem. For the poem, Barlow created 12 illustrations, the first time he had ever done interpretive drawings. 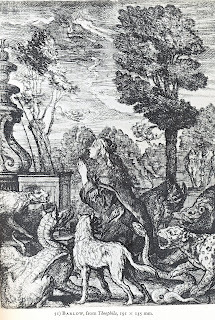 In the first picture, Barlow shows Theophila kneeling before the Fountain of Christ, surrounded by growling animals with Adam and Eve in the background. The detail that went into this piece is quite amazing, especially since this was etched onto a metal plate. The various directions of the lines were quite important to ensure detail was not lost. The different values are created by the distances between these lines, the closer the lines, the darker the image. Barlow is also famous for his illustrated edition of Aesop's Fables, which, unlike Theophila, mainly depicts animals. In the second photo, Barlow shows animals' in motion in a very realistic way. 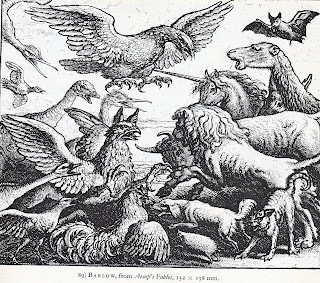 Once again, although this is an etching, the distinction between each animal is not lost because of the finely detailed lines. Barlow was also one of the first English political cartoonists. In the last picture , he depicts the King of Spain riding on top of a cow representing Holland. 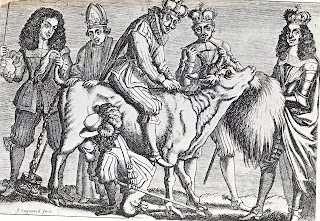 Beside them are the King of Denmark, Louis the XIV and the Bishop of Munster, with an unidentified prince drinking Holland's milk. This picture shows a more purposeful side of drawing with a parody of political figures. It seems that Barlow did not just draw for his own enjoyment. He actually typically had an external reason to drawing, for a job or for a message. It is a shame though that it seems he died of poverty. With regards to visual art, I have always found the elements of movement and animation fascinating. I personally feel that the ability to convincingly create the illusion of motion in a still piece of art is near the pinnacle of artistic ability. Consequently, I was excited to find that the Renaissance artist Raphael Sanzio had actually had studied and practiced intensely to capture a sense of dynamism in his work. Raphael Sanzio lived from 1483 to 1520 in Rome. He was born the son of the court artist Giovanni Santi, from whom he presumably learned to paint at an early age. Having studied under several teachers, Raphael is noted for is uncanny ability to absorb the styles of other artists and incorporate it seamlessly into his own works. His career took off at age 13, 6 years after his father's death. He and a painter from his father's workshop were commissioned to work on an Altar Piece in Citta di Castello. Soon after, Raphael relocated to Florence and finally to Rome, where he worked for Pope Julius II and his successor Pope Leo X. Raphael was indisputably the dominant artist in Rome until his death in 1520 at age 37. Like the majority of Raphael's paintings, Study for the Borghese Entombment, 1507, is a study for a later painting. The drawing was done in pen and ink with traces of under-drawing in black chalk. 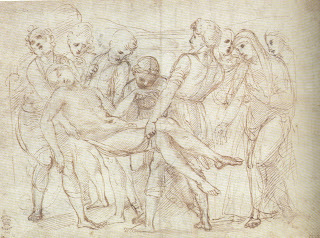 The abundance of diagonal line work truly conveys the weight of Christ's body on the bearers, a perfect example of Raphael's ability to capture movement. Cartoon for St. Catherine of Alexandria, 1507, is a drawing done solely in black chalk. I chose this drawing because of the sense of movement captured in the portrait by the use of curves. Historically, this portrait is reminiscent of ancient sculptures of the goddess Venus. 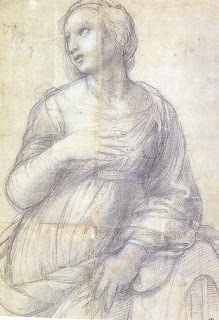 Study for the left side of the Disputa, 1508, is my favorite drawing out of the three. The material used for the drawing is diverse, including pen and ink with wash over stylus and some white heightening. I particularly like how the figure at the far left has been highlighted in white to emphasize his movement up the staircase, a rather overt case of dynamism in a drawing. Van Cleave, Claire. Master Drawings of the Italian Renaissance. Harvard University Press,2007. As I was searching for an artist’s drawings to study, I came across some of Leonardo da Vinci’s famous sketches. His art is particularly interesting because he was a true “Renaissance man,” and his art reflects his many talents. Da Vinci was born in 1452 in Italy. As a teenager he apprenticed with Andrea del Verrochio in Florence, and soon moved to Milan and served the Duke. After working in Rome and France, he died in 1519. Throughout his years he kept notebooks of drawings, including sketches of later famous paintings, anatomy, and ingenious machines. I decided to use a study of his famous Last Supper masterpiece. Da Vinci painted the piece under the patronage of Duke Ludovico Sforza between 1495 and 1498, and he finished his study around 1480. His strategy, called historia, expanded on the work of the famous painter Alberti. Beginning with The Adoration of the Magi, da Vinci told narratives through his paintings, but did not necessarily paint realistically. In fact, The Last Supper is anachronistic in that it depicts a series of events within one snap-shot. He dramatized Judas’ betrayal and the introduction of the Eucharist within one painting. Although he possessed a mathematical mind, his study for The Last Supper exhibits his expressive style of drawing. His sketches are rough, but the movements of the bodies and facial expressions are very dramatic. In writings recovered with this study, da Vinci described the facial expressions and body movements of each of the disciples, suggesting that the narrative is as important as the painting itself. His use of shading also tells a story. Jesus is the lightest figure, and he seems to be the light source. His groupings of the disciples demonstrate his emphasis on telling a symbolic story through his paintings. 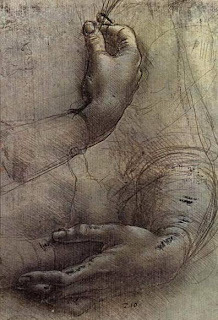 Da Vinci’s marks are very consistent, and even though the sketch is a rough approximation, it conveys the necessary shading and value, as well as the story line. As my second sketch, I chose a study of hands (c. 1474) that is believed to be a preliminary drawing for the portrait of Ginvera de’ Benci. As in the previous study, da Vinci calculated the position of each body part, in this case, hands, in order to communicate his intended message. In fact, he seems to have adjusted the right hand at least once, as a "ghost" sketch appears in another more relaxed position. Again, his style is expressive. As evidenced by the rough outline of the arms, da Vinci worked from the general to the specific, or made a rough outline before filling in the details. A closer look shows that da Vinci used a hatching technique to create value and light. As my final sketch, I chose a study of another famous painting, The Virgin and Child with St. Anne. 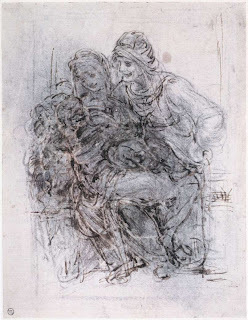 The sketch, completed in the early 1500s, illustrates yet again da Vinci’s interest in depicting the movements and expressions of his subjects to tell a particular story. His study differs from the final painting in that the drawing depicts the Madonna, St. Anne, and Jesus leaning towards the left, whereas the true painting depicts the movement towards the right. 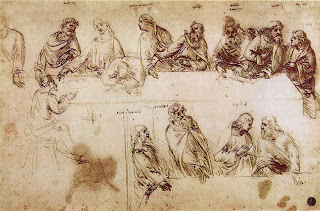 His other studies for the same painting illustrate the three characters in different positions, which suggests that da Vinci struggled with his vision. The sketch is very rough, and is barely decipherable, save for the facial expressions of the two women. His expressive and rough style implies that he cared, at least in his preliminary drawings, about the movement of the painting, and drew and painted from the general to the specific. Arasse, Daniel. Leonardo Da Vinci: The Rhythm of the World. New York: Konecky and Konecky, 1998. “Leonardo Da Vinci: Renaissance Man.” Museum of Science. 24 February 2009 <http://www.mos.org/leonardo/bio.html>. 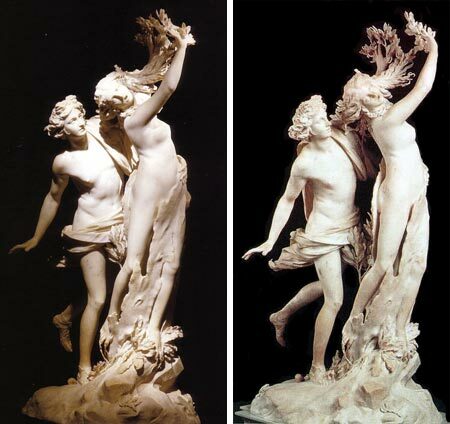 The curious sculpture Apollo and Daphne , with its angled lines and voluptuous contours, is an excellent example of Bernini’s ability to incorporate movement and depth into his works. I have always been interested in seeing how various artists dealt with the “problem” of translating a three-dimensional image onto a flat sheet of paper. It was always interesting to me that, even in the Classical period, sculptures, too, seemed restricted in their design so as to be viewed from a single angle. Bernini designed extremely emotive works that could almost be construed as entirely new pieces from each different perspective. He managed to create a rich source of visual material with which to work, at least when it came to my attempts at translating his works onto pencil and paper. With Apollo and Daphne, contortion and minute attention to detail—especially when incorporating new information with each angle—makes the image particularly vivid and dynamic. As Apollo leans forward to grasp the nymph’s waist, she begins to turn into a tree, escaping his grasp even as he holds her in his arms. The work is not too original in its subject matter, other artists in the Renaissance and Baroque had shown special attention to the Greek myths. The gods of ancient Greek history represented the idealized human form. Additionally, the myths were a vehicle for highlighting human emotion, capitalizing on the pathos of the Greek tragedy. Bernini’s figures are unique in that they blur the line between marble and flesh, static representation and fluid movement. The lack of straight lines and the rich detail in the varying planes of viewing—front, back, and side-angles—contribute to this sense of movement, and so when the nymph lunges forward and away from her pursuer, it almost seems as if she is leaping through the air. The sculpture becomes a scene rather than a mere carving of two figures, which in turn shifts the focus from a strict viewer/subject divide into a dynamic unveiling of the interaction between the figures themselves. 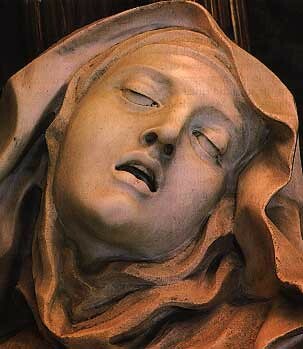 I realize the first image is not a drawing, but it shows Bernini in his best medium, I believe. The first self-portrait posted above was created in 1624 when Bernini was still under the patronage of pope Urban VIII. This is a humble work compared to other projects he did during this period, such as the massive gilt-bronze baldachin he designed for the tomb of St. Peter in St. Peter’s Basilica. At the same time, the sketch has its own unique appeal in its use of line and shading. One of the most interesting characteristics of this work is its use of variations in line thickness and darkness to represent the reflection of light off of a hairline. As a sketch, it was probably not intended to be viewed as a separate piece but as a starting point for a full painting. The edges of the neckline and even the right jaw-line is not strictly defined, instead, deep strokes create the illusion of depth by shrouding that part of the face in shadow. Adding to what I call an “unfinished feel” is mingling of smudging techniques and a subtle hatching technique. The lines in areas of heavy shadowing like the top of the head and the area below the chin are still somewhat discernable, but because they are all in one uniform direction (like the hair strands) or in many different directions (such as the base of the neck), the viewer interprets them as one unit. One advantage of being a sculptor as well as a sketch artist and painter is that it allows one to test out certain visual compositions before committing them to marble (or guilt-bronze, as the case may be). Bernini often would sketch out his sculptures prior to beginning the sculpting process. 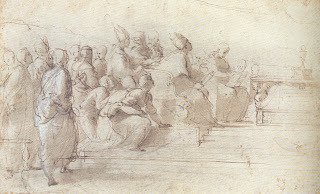 These sketches can range from very detailed (for example, his Study for the figure of “Daniel” in the Chigi Chapel, S. Maria del Popolo) to very loose and cartoon-like (such as his “Studies for the Statue of Truth”), the latter possibly functioning as a means of seeing how the entire work would look as a unit or jotting down ideas for future compositions. Bernini’s versatility with sketching and drawing is evident when one compares the highly realistic self-portrait to his more abstract, simple sketch of his Ecstasy of St. Teresa. In the second one, created with chalk on paper, the lines that denote shadowing are much more visible and there is minimal smudging. Clearly the emphasis with the close-up of St. Teresa is on the angle of her face and the effect of this posture on the coif and the veil of her nun’s habit. Comparing the finished product (top image) to the sketch, one gets an idea of the function of these sketches; they capture the overall impression of the work—testing out the shadow, the silhouettes and overall composition of the sculpture. A “child prodigy,” Bernini began sculpting at a very early age and has often been associated with the Italian Baroque as one of its most prominent figures. He was the son a sculptor, Pietro Bernini, of lesser renown in Naples. He began his career as a master sculptor very early in life, according to one anecdote (perhaps exaggerated by the none-too-modest artist) he presented a bust of St. John to Pope Paul V. The Pope did not believe that the ten-year-old miniature master was indeed the artist behind the likeness, and so decided to test him by having him create a sketch right in front of him. Apparently, the sketch must have been of great quality, seeing as he began working under the patronage of the Pope from that moment on. But Bernini’s great works were not created in a vacuum, indeed his formidable years took place in a period of great artistic flourishing throughout Italy, called the High Renaissance. His primary influences were from antique Greek and Roman marbles (which explains both the style and subject matter of the Apollo and Daphne piece, with its poignant pose reminiscent of the Greek Hellenistic period), as well as contemporary artists like Michelangelo and other High Renaissance painters. He had many patrons over the course of his life and was especially favored by the Church. His works under the patronage of Cardinal Scipione Borghese include the previously mentioned Apollo and Daphne, and his famous David (1623-24). At the height of his artistic renown, Bernini was commissioned large projects by the Church, including the larger-than life statue of St. Longinus in St. Peter’s church, which he sculpted from 1631-38. His work in portraiture was also developed greatly during this period of time, and his repertoire included a series of commissioned portrait busts of Pope Urban VIII. His fantastic, highly elaborate fountains were commissioned under the patronage of Pope Innocent and Alexander VII, this includes the Fountain of Four Rivers which is located in the Piazza Navona. I remember staring at my art history book, analyzing every intricate detail, the painstaking efforts taken to get the composition just right. In the end, there is a kind of triangular build, but there is so much movement in the individual figures that the underlying order of the structure is very subtle. Later in life, he concentrated more on architectural works like the massive colonnade in front of St. Peter’s Basilica in Rome. In 1665, he took up an invitation to visit Paris from King Louis XIV himself. He made the mistake, however, of insulting the French court by expressing his preference for Italian art over that of France—a costly mistake since it probably kept him from gaining further commissions from the King. He did, however, make an impressive portrait bust of King Louis XIV before leaving Paris. His final years are probably not given as much publicity as the previously mentioned commissions, but there are a few that are noteworthy. Daniel in the Lion’s Den (1655-61) is part of a two group project created for the Chigi Chapel in Rome. The emotional, dramatic figures are emblematic of the artist’s maturation of style and composition. After an impressive and prolific career, Bernini died at the age of 81 in Rome in 1680. His works, whether paintings, sculptural groups, portraits or architectural projects, would set the standard for Baroque art throughout Europe for nearly a hundred years. Scribner, Charles. Bernini. New York : H.N. Abrams, Publishers, 1991.